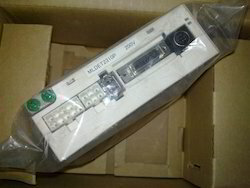 Star Automations Provide solutions to your Problems by designing and manufacturing Special Purpose Machines and Automation systems to satisfy your needs.Panasonic MINAS E-Series is a unit of an AC servo motor and driver with downsized capability and performance that are useful for positioning of a motor whose capacity is small from 50W to 400W. By adopting 2500 P/r incremental encoder with velocity response frequency of approximately 400Hz and 5 wires, we could omit wiring. The equipment includes real time auto tuning and enables automatic setting of complicated gain tuning. If you are looking for Panasonic Minas E series servo system, please contact us. We will do our best to help you find the Panasonic MINAS E servo motors and drives that you are looking for at the most competitive prices possible.